External Seminar/Congress : - 34th M.P. Young Scientist Congress (Feb. 28 - March 01,2019) at Rajiv Gandhi Proudyogiki Vishwavidyalaya, Bhopal. 34th M.P. Young Scientist Congress (Feb. 28 - March 01,2019) at Rajiv Gandhi Proudyogiki Vishwavidyalaya, Bhopal. Date of Seminar has been postponed till further notice. Due to unavoidable reasons proposed 10 days national workshop on Tribes of Chhattisgarh which is scheduled 15-24 February, 2018 has been postponed. It is expected date 16th to 22nd/25th April 2018. All details will be intimated as shortly as possible. 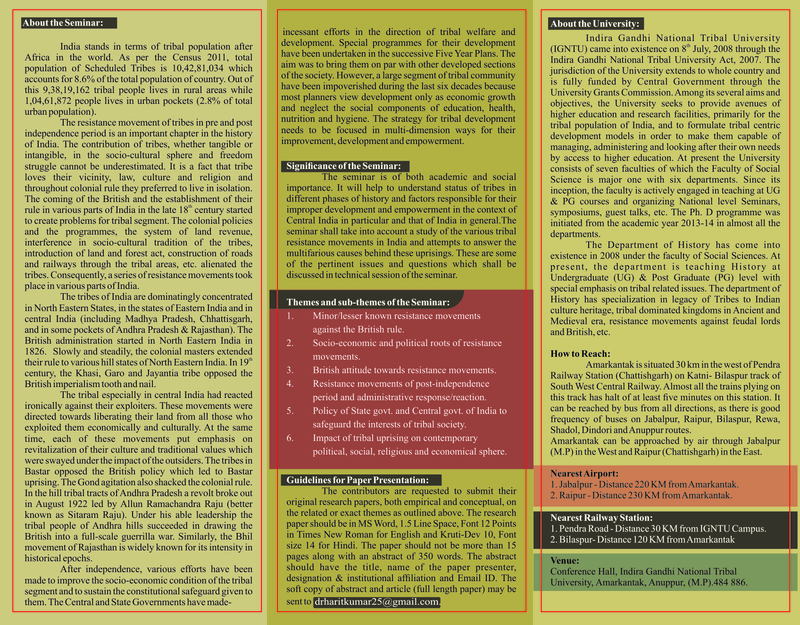 Two Day International Conference On “India and New World Order in Contemporary Global Politics” (20-21, March, 2018). The last to submit to abstract for International Conference has been extended till 25th February 2018. The Department of Yoga, IGNTU, Amarkantak is organizing a National Seminar in the month of March, 2018 (2nd or 3rd week) covering major disciplines of Yoga Practices & Traditional Medicine. The Department of Pharmacy, IGNTU, Amarkantak is organizing a National in the month of March, 2018 (3rd or 4th week) covering major disciplines of Pharmaceutical Science and related area of applied health sciences. National Seminar on Recent Developments in Chemical Science (RDCS-2018) on 23-24th February 2018. The last date of Registration and abstract submission of National Seminar (RDCS-2018) in the Department of Chemistry on and before 31st January 2018. Two Day National Seminar on “Innovative Management Practices for Sustainable Development” on 26 and 27 February, 2018. Reschedule National Seminar on Recent Developments in Chemical Science (RDCS-2018) on 23-24th February 2018. Two Day National Conference on Mediascape in 21st Century: Emerging Perspectives With special emphasis on indigenous and tribal social communication on 9th & 10th march, 2018. 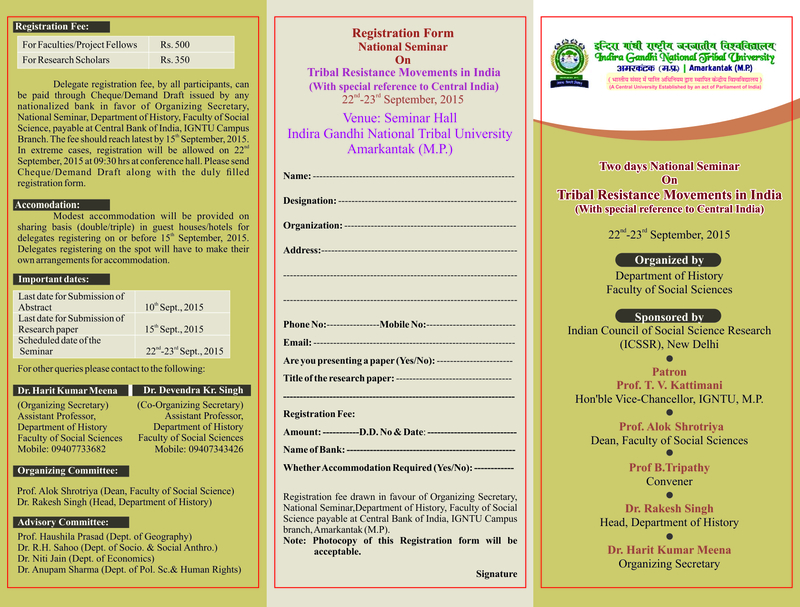 National Conference on “Tribal Situation in India: Contemporary Issues and Concerns” will be organized by Indira Gandhi National Tribal University (IGNTU) in partnership with Indian Anthropological Society (Kolkota) and Rashtriya Manav Sangrahalaya (Bhopal) . National Seminar on Tribal Situation in India: Contemporary issues and concerns" scheduled to be held on November 08-10, 2017 is postponed to January 29-31, 2018. National Seminar on Role of Science and Technological Interventions for Tribal Development on dated 29th to 30th November 2017. The last date of Registration and abstract submission of National Seminar in the Department of Chemistry" Recent Developments in Chemical Sciences (RDCS-2017) on and before 20th October 2017. 3 Days International Seminar on New Education Policy and NAMODI Framework. Date 12-14 July 2016. Inauguration by Honorable Smt. Sumitra Mahajan Ji, Speaker, Lok Sabha. Two Days National Seminar at RCM on 12th-13th February 2016. Department of Political Science, IGNTU, Regional Campus, Manipur is organising a two days National Seminar on “India’s Act East Policy: Problems and Prospects for North-east India” on 12th-13th February 2016. The seminar is sponsored by Indian Council of Social Science Research (ICSSR), New Delhi. Department of Linguistics and Department of Journalism and Mass Communication, Indira Gandhi National Tribal University (IGNTU), is organising a two days National Seminar on “Indian Tribes in the Media: Story or a Non-Story” on 13th-14th February 2016. Department of Social Work & Department of Sociology, Indira Gandhi National Tribal University (IGNTU), Regional Campus, Manipur is organising a two days National Seminar on “Ethno Science and Traditional Technology of Tribes and Indigenous Peoples of Northeast India” on 5th-6th February 2016. The seminar is sponsored by Indian Council of Social Science Research, New Delhi. Ten Day Research Methodology Workshop for Ph.D. Research Scholars/ in Social Sciences & Management. Organized by - Department of Business Management , IGNTU, Amarkantak. Sponsored by - Indian Council of Social Science Research (ICSSR), New Delhi. Scheduled On - From 20 to 29 of January, 2016. A Seminar on the topic “Multilingual India and Tribal Societies” organized by Dept of Linguistics, Faculty of Tribal Studies, IGNTU, Amarkantak. From 20 to 22 of November, 2015. Your contribution by presenting a Paper are taking part in discussion is requested. The Department of Social Work, Indira Gandhi National Tribal University (IGNTU), Regional Campus, Manipur in collaboration with the United NGO Mission, Manipur; Centre for Research and Advocacy, Manipur & Biodiversity, Ecology & Environment Network-Manipur is organising a TWO-DAY INTERNATIONAL MEET ON CLIMATE CHANGE on September 22 – 23, 2015. Interested individuals can submit abstract (about 400 words) in English and Manipuri with author profile (around 50 words) on any of the sub-themes given below on or before September 20, 2015 to hanjabam@gmail.com. Scheduled On- 17th- 18th September, 2015. Interested scholars may submit an abstract on any of the theme or similar topic related to the broad theme to the coordinator: soihiam@yahoo.com on or before 14th September 2015. Kindly send your phone number along with the abstract. Scheduled On- 22nd- 23rd September, 2015. The seminar is scheduled on 22nd- 23rd September, 2015. The Seminar shall take into account various tribal movements in India during the British rule as well as in the post-independence era with special reference to Central India. @Indira Gandhi National Tribal University, Amarkantak. All rights reserved. Concept & Developed by Arvind Gautam, System Analyst & Abhijeet Singh.